I was born in Lithuania in a small village of 20 families. When I was like ten years old I counted how many people there were and when I counted there were 98 people in that village. And the north part of Lithuania, about 60 miles south of Riga, which is in Latvia already, and I was born on December 24th of 1922, though in my passport it says 23rd of December, because I never, where I come from, nobody pays much attention to birthdays. This is some kind of further Western kind of idea, Western Europe and etcetera. We never celebrated our birthdays and it never, I had problems of remembering, so when first I had to tell my birthday, I said December 23rd, and though, you know, it's the 24th. So in my passport it's 23rd and I don't want to correct it because if I ask them to correct it they may send me back to Lithuania, or something like that, which Lithuanian immigrants now, there are students and artists who come, they consider that the worst punishment to them would be they would be sent back to Lithuania. In any case, in a small village, farming my, on a farm and that's where I grew up with, in a family of father, mother and five, five of, six of us - one sister and five boys. 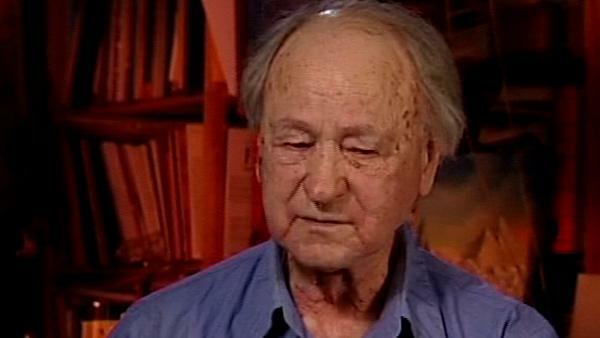 Jonas Mekas (1922-2019), Lithuanian-born poet, philosopher and film-maker, set up film collectives, the Anthology Film Archive, published filmzines and made hundreds of films, all contributing to his title as 'the godfather of American avant-garde cinema'. He emigrated to America after escaping from a forced labour camp in Germany in 1945. Amy Taubin is a contributing editor for "Film Comment" magazine and "Sight and Sound" magazine. Her book, "Taxi Driver", was published in 2000 in the British Film Institute's Film Classics series. Her chapter on "America: The Modern Era" is part of "The Critics Choice" published by Billboard Press, 2001, and her critical essays are included in many anthologies, mostly recently in "Frank Films: The Film and Video Work of Robert Frank" published by Scalo. She wrote for "The Village Voice" weekly from 1987 into 2001 both as a film and a television critic. She also wrote a column for the "Village Voice" titled "Art and Industry" which covered American independent filmmaking. Her first weekly film criticism job was at the "SoHo Weekly News". Her writing has also appeared in "Art Forum", the "New York Times", the "New York Daily News", the "LA Weekly", "Millennium Film Journal", "US Harpers Bazaar" and many other magazines. She is a member of the National Society of Film Critics and the New York Film Critics Online. She started her professional life as an actress, appearing most notably on Broadway in "The Prime of Miss Jean Brodie", and in avant-garde films, among them Michael Snow's "Wavelength", Andy Warhol's "Couch", and Jonas Mekas' "Diaries, Notebooks and Sketches". Her own avant-garde film, "In the Bag" (1981) is in the collection of the Museum of Modern Art and the Friends of Young Cinema Archives in Berlin. She was the video and film curator of "The Kitchen" from 1983-1987. She has a B.A. from Sarah Lawrence College and an M.A. from N.Y.U. in cinema studies. She teaches at the School of Visual Arts in both the undergraduate and the MFA graduate programs, and lectures frequently at museums, media centers, and academic institutions. In 2003, she received the School of Visual Arts' art historian teaching award.